If you’ve been accused of a crime in Massachusetts, it is difficult to know what to do next. That’s how you’ve found yourself on the website of a criminal defense lawyer. In 20 years of my criminal defense practice, I’ve talked to thousands of people. A pending criminal charge is scary, so I understand that you are nervous. You have many questions and aren’t sure where to turn. But I can get you answers fast and help you fix this problem. These can be complicated questions, but I can answer all of them. I will tell you exactly how much this will impact your life. And most of the time, it’s not nearly as bad as you think. That’s really what I do as a lawyer. I answer questions and help people solve problems. No one ever expects to be facing a criminal charge, so it is understandable that you don’t know what or who to ask. But now it’s happened to you, and it’s something you can’t avoid dealing with. I can help you solve your problem. I help people avoid the consequences of a criminal conviction and a permanent criminal record that shows up on a background check. My name is Russell Matson. 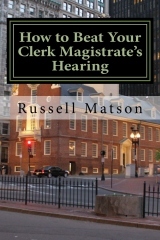 I am a Massachusetts criminal defense lawyer who has defended people in every district court in the state. My firm and I have defended clients facing charges ranging from serious felonies such as multiple offense OUI, vehicular homicide, assault with a dangerous weapon, sexual assault, armed robbery, kidnapping, and home invasion. More typically, my clients are regular folks accused of relatively minor misdemeanor charges such as shoplifting, assault, drug possession, or motor vehicle crimes like leaving the scene of an accident and negligent operation, and everything in between. You can see some of my recent case wins here. I help regular people, who through bad luck or bad judgment find themselves on the wrong side of the criminal justice system. I help regular people who have been treated unfairly and accused of something they didn’t do or maybe just charged with a serious crime that is vastly out of proportion to the facts. I help regular people who have made mistakes, and are often deeply sorry and embarrassed about what they did, and want to put their lives back together and move on. I help regular people get back on the road after a license loss due to a DUI or other criminal driving charges. Whatever the circumstances, I can help. As a criminal defense lawyer in Massachusetts, it is my job to challenge the state to prove every element of the charges against you. My role is to defend you and only you. I can be there to help you get you the fair treatment you deserve in court. Any criminal case comes down to two basic choices. Do we fight the case at a trial, or do we work out a deal for the minimum possible sentence? The goal in most situations is to avoid a criminal conviction and a criminal record. So whichever strategy gets us that outcome is the one we will pursue, as well as whatever ultimately aligns with the client’s wishes and best interests. It could be a combination of pushing for a deal that avoids a criminal record, and if that isn’t happening, being prepared to take the case to a jury trial. If you are ready to find out what I can do for you, please call or text me today. I will go over the facts of your case, and let you know exactly what I think your best options are. And if you decide to hire me, I’ll quote you a flat fee for my services. It may be a lot less than you expect. Either way, there is no obligation for my advice and the benefit of my experience in fixing these matters. Our firm has successfully represented clients in every district court in Massachusetts. Our home court is the Quincy District court, but we’ve been to all of them. If you want to meet in person at our office, we welcome the opportunity to discuss your case in person so you can decide if you want to hire us. But if you need representation and don’t happen to be near our offices in Braintree, we do most of our consultations over the phone. If you hire us, we can meet you in the court you need to be, as soon as tomorrow. Please contact me today. I can help you get through these legal problems, as quickly and painlessly as possible. Drop me a line, take advantage of my considerable experience in court on criminal cases, and that of my well-trained and sympathetic staff. There is a good chance we can help. Call or text (781) 817-6332 for a consultation on a Massachusetts Criminal Charge.